Malaysia’s ringgit sank to a 17-year low as concern about the finances of a state investment firm at the heart of a political scandal worsened the outlook for an economy rocked by plunging oil prices and an emerging-market sell-off.The ringgit depreciated 1.3% to 4.2680 a dollar as of 10:17 am in Kuala Lumpur, reversing Tuesday’s 1.2% gain, according to prices from local banks compiled by Bloomberg. It reached 4.2990, the lowest since July 1998, and has weakened 18% in 2015. Abu Dhabi’s International Petroleum Investment Co may pull out of a plan to help restructure 1Malaysia Development Bhd‘s US$3.5 billion ($4.9 billion) of debt, in an earlier report by BT. China’s move to cut interest rates for the fifth time since November failed to lift the ringgit, which has been battered by a slowing economy and a scandal involving fund transfers to Prime Minister Najib Razak. “The ringgit’s underperformance could be due to the report that Abu Dhabi’s IPIC may pull out of 1MDB’s debt plan,” said Nizam Idris, Singapore-based head of foreign-exchange and fixed-income strategy at Macquarie Bank Ltd. “That could make it difficult for 1MDB to resolve its debt, which will weigh on the country’s risk.” The UK-based Sarawak Report and the Wall Street Journal last month reported on documents that almost US$700 million may have moved through state agencies and companies linked to 1MDB before ending up in accounts bearing Najib’s name. That led to calls for the prime minister’s resignation. The Malaysian Anti-Corruption Commission‘s statement on Aug 3 that Najib had received 2.6 billion ringgit ($853.4 million) from donors and not 1MDB has failed to assure investors. Global funds have pulled more than US$3 billion from the local stock market this year and overseas investors’ holdings of the nation’s debt fell to a three-year low in July. The 58% drop in Brent crude from a year earlier is hurting revenue for oil-exporting Malaysia and weighing on the ringgit amid an emerging-market selloff spurred by the yuan’s devaluation this month. A 16% slump in palm oil prices is also hurting the world’s second-biggest producer of the commodity. “News that Abu Dhabi’s IPIC could pull out of plans to help 1MDB restructure its debt likely weighed on sentiment,” said Khoon Goh, a strategist at Australia & New Zealand Banking Group Ltd in Singapore. 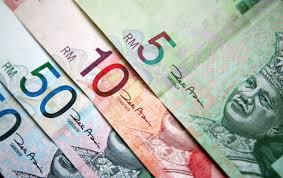 “Weak commodity prices, especially crude and palm oil, are adding to the bearish tone.” One-month implied volatility for the ringgit, a measure of expected exchange-rate swings used to price options, surged 2.86 percentage points to a record 18%. Government bonds fell, with the 10-year yield rising two basis points to 4.43%, Bursa Malaysia prices show.